Setting up a bird feeder at your backyard or in your neighbourhood is one of the best ways to attract birds. Birds generally take shelter during the winter season and it is quite impossible for them to go around looking for food. If you love bird watching and keen on keeping the planet friendly enough for every creature that exists, you should definitely adopt this practice of feeding the birds. 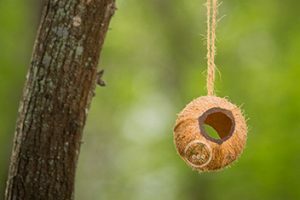 A bird feeder could come in any shape and size, provided it meets certain standard definitions of a bird feeder. For instance, good space must be provided appropriately inside the feeder for the birds to come and go, feeder should be made of an ecofriendly product and many factors are there to keep in mind. Also location of the feeder plays a significant role in attracting the birds to your feeder. To begin with, try observing for some time what are the birds that visit your neighbourhood often. Some birds are seasonal while some retain a habitat in your area. For a tropical country pelicans, hawks, kites, eagles, cuckoos, pigeons, parrots, falcons, cranes, doves, owls, kingfishers, hornbills are some of the common species to be spotted. See for the birds that are very common in your colony and get a list prepared. Once you come to know about the birds that visit often, have a research done in detail from their scientific name to their regular routines to their food intake. Most of the birds would require liquid essentials during summer and solid food during winter. Once the birds get to know the location of the feeders, they make it a part of their habit to visit it often. Some seasons are good and some seasons are bad for the birds. It is generally during the winters they find it highly difficult to hunt food. During this season, make sure you buy food that are suitable for every bird that visits. Once you fix on the food, concentrate on your feeder. It should hold the food properly without any spillage. It should be crack-resistant for any season. It should have a lot of room for the movement of birds. Have a check of the feeder inside out every time you fill it and rectify the problems in it, if there are any. Maintaining the feeder is equally important as much feeding the birds. Watch out for the birds when it comes to have its food. If they have swollen eyes and move sluggishly it means the bird is sick and it may cause an outbreak of a virus at your feeder. In this case, remove the feeder, wash and sterilize and leave it down for a week. Apart from this, wash the feeder once in a week with lukewarm water along with a soap. During rainy seasons, make sure to wash it immediately after a downpour. If you have a pet animal with you, make sure it stays indoors during the time of bird visits as they can easily scare them away. On the whole the bird feeder acts a blessing for the birds which would struggle to find food most of the time. Let us be responsible in taking care of our winged feathers in creating a sustainable environment for all.